In 1870, Father Noel-Joseph Ritchot (1825–1905) began the construction of this chapel dedicated to the Blessed Virgin Mary. Father Ritchot credited the Virgin with intercession in the 1869–70 dispute between the Métis nation and the Government of Canada. That dispute, settled through negotiation, resulted in the inclusion of Métis land, language, and school rights in The Manitoba Act of 1870, the basis of the River Settlement’s entry into Confederation. 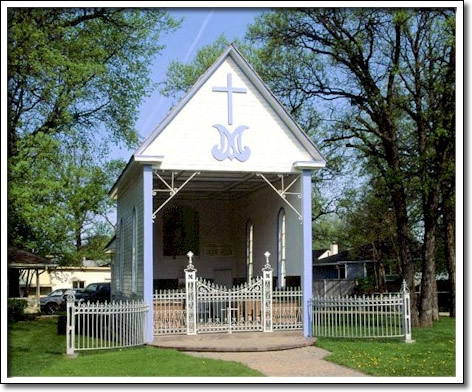 Chapels, shrines, grottoes, and wayside crosses once dotted the Manitoba landscape. This chapel is one of only a few open-air religious structures remaining in the province. The interior finishes, statue, and furnishing are unparalleled in any other similar structure. The original panelled ceiling, now housed in the adjacent church, was painted in the mid-1880s by Constantin Tauffenbach, a German-born artist.